Use these 7 questions to plan how to maximise every sales opportunity and smash your targets. The truth is, owning or managing a business is an awesome way to carve out your dream life. But, the reality of that role is often filled with challenges and frustrations that can sometimes feel relentless. If you’d like to reduce the stress that owning or running a business often brings, remember that ‘more sales fixes most things in business’. Steve, Darren and the team will teach, train and coach you through a complete selling transformation, one step at a time. When you work with the team at ITC you’ll learn the most up-to-date hard skills (sales techniques), and explore the all-too-often soft skills (communication methods such as NLP and DISC), and how to combine them to establish you as a true Sales Authority. When you are a Sales Authority, you gain a massive advantage over other sales professionals, as well as an unprecedented ability to smash your sales targets. ITC has helped businesses all over the world double and even triple their sales income. And we can help you improve the financial performance of your business too! At Impact Training, we understand the challenges that business owners and managers face when it comes to sales. Typically these include the struggle of growing sales and meeting targets, constant objections from hot leads, difficulties closing sales, team members who don’t meet their KPIs, a lack of culture or team cohesiveness, and the list goes on. We believe that every person has the potential to sell, and sell successfully, because great sales people are made, not born. We teach people an holistic approach to selling, that will increase their closing rates, and transform them into a Sales Authority. We achieve this by teaching them how to blend hard and soft skills, such as communication skills, price presentations, team culture, measuring KPIs effectively, body language, DISC behaviour analysis, buying behaviour psychology, and lots more. Our training is available online and face-to-face, and can be delivered to groups or one-to-one. To discuss your needs, simply book in a call with one of our team members by clicking here. 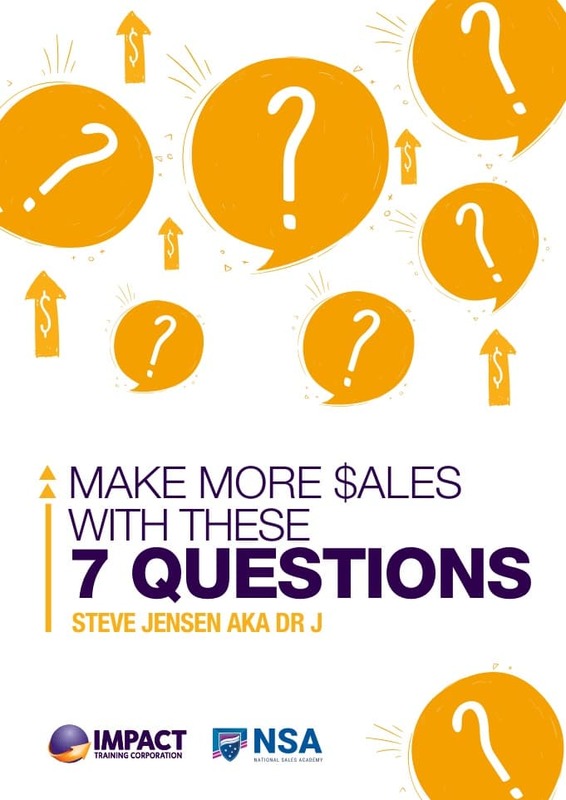 At last - a complete guide to help you increase your sales, use these 7 questions to plan how to maximise every sales opportunity and smash your targets. This is easily the most comprehensive guide available on how to make more sales, that doesn’t rely on outdated ways of dropping prices and push sales techniques. People from all around the globe have doubled and tripled their sales income, as a direct result of what they’ve learned from Impact Training Corporation and Steve Jensen, the Founder of ITC. No matter what your industry or type of business, it’s a known fact that if you have the opportunity to learn from Steve, you grab it! The knowledge and skills you’ll gain are designed to help you become a successful business professional. Richard Toutounji: "Steve customised his workshop around our needs. My team learned the benefits of communication and body language and learned the different stages of closing. We also learned how to present our USPs across all channels." Brikitta: "I have learned how have fun with sales, bring back passion and expertise, its not sales and it’s just believing in your product." Stephen Lockley: "Steve has helped us grow our business internationally and ten fold into a multimillion dollar business. He helps everyone maximise their sales potential."